Hm, the last time I had so many apples, it was an Aberlour. Except for parts of the nose and the pepper a rather uncomplicated candidate. Is in itself consistent, but rather not my thing. Anyway, he is very sweet, every sip makes him better ... Notes from a blind tasting. The alcohol is excellently integrated and is also well covered by the flavors, I would have thought it much weaker. Sherry with yellow fruit note, caramel and some sweat. Overall, initially a bit restrained. After a short time, raisins, grass and herbs are added. After some time, apples, ripe and overripe. It takes him a while to settle down, but then everything mentioned above is interwoven into an overall picture and looks harmonious, still focusing on apples, looks rather dry overall. Heats up much herbaceous and the apples are now clearly fermented, the raisins also slightly stronger ..
Sweet, lots of raisins and also here later ripe apples, in addition a good portion of white pepper right at the beginning with moderate onset, which concerns the alcohol. The mouthfeel is pleasantly oily, to the rear it dries clearly, with a good dose of herbs. These cover it then also that the alcohol shows itself backwards still with an ethereal note. In the finish, it then dries completely, the sweetness is soon gone, but the herbs do not stay too long. At the end there is a mixture of potato starch and apple greek. Overall, the finish is rather short and it does not last long. 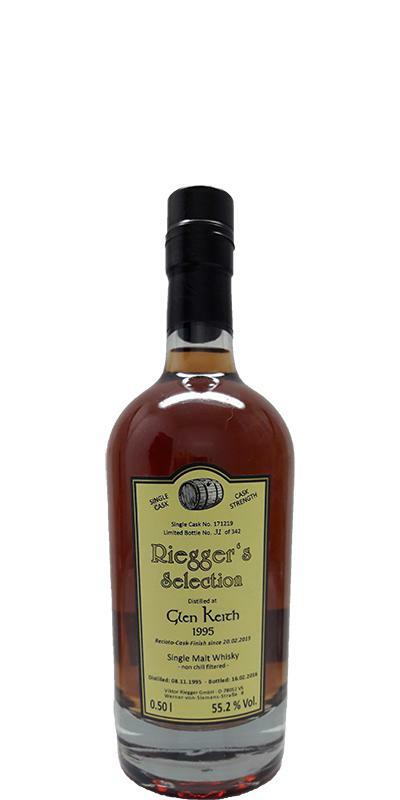 This is a great 20yo wine cask finished single cask scotch for a reasonable price! Beautiful, full, dark fruit, sweet perfume, honey, caramel, milk chocolate, very yummy. tingling on the tongue, at first an alcoholic note, much spicier than in the nose. very strong, dominated by alcohol, then tasty, long and spicy. Later warming with a load of nuts and oak.